A new theory of how the brain constructs emotions that could revolutionize psychology, health care, the legal system, and our understanding of the human mind. When you’re anxious, you feel worked up, jittery, like you’re worried something bad will happen. In depression you feel miserable and sluggish; everything seems horrible and life is a struggle. My first “botched” experiment actually revealed a genuine discovery—that people often did not distinguish between feeling anxious and feeling depressed. A skilled interior designer can look at five shades of blue and distinguish azure, cobalt, ultramarine, royal blue, and cyan. My husband, on the other hand, would call them all blue. My students and I had discovered a similar phenomenon for emotions, which I described as emotional granularity. Our comprehensive meta-analysis found little to support the classical view of emotion. The amygdala, for example, did show a consistent increase in activity for studies of fear, more than what you’d expect by chance, but only in a quarter of fear experience studies and about 40 percent of fear perception studies. Scientific evidence shows that what we see, hear, touch, taste, and smell are largely simulations of the world, not reactions to it. Your concepts are a primary tool for your brain to guess the meaning of incoming sensory inputs. Every moment that you are alive, your brain uses concepts to simulate the outside world. Without concepts, you are experientially blind, as you were with the blobby bee. With concepts, your brain simulates so invisibly and automatically that vision, hearing, and your other senses seem like reflexes rather than constructions. Now consider this: what if your brain uses this same process to make meaning of the sensations from inside your body—the commotion arising from your heartbeat, breathing, and other internal movements? From your brain’s perspective, your body is just another source of sensory input. Sensations from your heart and lungs, your metabolism, your changing temperature, and so on, are like the ambiguous blobs of figure 2-1. These purely physical sensations inside your body have no objective psychological meaning. Once your concepts enter the picture, however, those sensations may take on additional meaning. If you feel an ache in your stomach while sitting at the dinner table, you might experience it as hunger. If flu season is just around the corner, you might experience that same ache as nausea. If you are a judge in a courtroom, you might experience the ache as a gut feeling that the defendant cannot be trusted. In a given moment, in a given context, your brain uses concepts to give meaning to internal sensations as well as to external sensations from the world, all simultaneously. From an aching stomach, your brain constructs an instance of hunger, nausea, or mistrust. In every waking moment, your brain uses past experience, organized as concepts, to guide your actions and give your sensations meaning. When the concepts involved are emotion concepts, your brain constructs instances of emotion. In recent years, a new generation of scientists has been crafting psychological construction-based theories for understanding emotions and how they work. Not every theory agrees on every assumption, but together they assert that emotions are made, not triggered; emotions are highly variable, without fingerprints; and emotions are not, in principle, distinct from cognitions and perceptions. The theory of constructed emotion incorporates elements of all three flavors of construction. From social construction, it acknowledges the importance of culture and concepts. 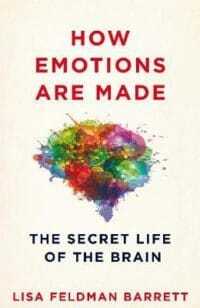 From psychological construction, it considers emotions to be constructed by core systems in the brain and body. And from neuro construction, it adopts the idea that experience wires the brain. You cannot reverse-engineer a recipe for an instance of fear from a feeling of fear. Holism explains why bread baked in my home in Boston is never as tasty as bread baked at my friend Ann’s house in Berkeley, California. The Berkeley loaf has a superior flavor because of the different yeasts floating naturally in the air and the elevation above sea level. These additional variables can dramatically impact the end product, and expert bakers know this. Holism, emergent properties, and degeneracy are the very antithesis of fingerprints. Simple pleasant and unpleasant feelings come from an ongoing process inside you called interoception. Interoception is your brain’s representation of all sensations from your internal organs and tissues, the hormones in your blood, and your immune system. Think about what’s happening within your body right this second. Your insides are in motion. Your heart sends blood rushing through your veins and arteries. Your lungs fill and empty. Your stomach digests food. This interoceptive activity produces the spectrum of basic feeling from pleasant to unpleasant, from calm to jittery, and even completely neutral. Through prediction and correction, your brain continually creates and revises your mental model of the world. It’s a huge, ongoing simulation that constructs everything you perceive while determining how you act. But predictions aren’t always correct, when compared to actual sensory input, and the brain must make adjustments. Sometimes a skipping stone is large enough to make a splash. Consider this sentence: Once upon a time, in a magical kingdom far beyond the most distant mountains, there lived a beautiful princess who bled to death. Did you find the last three words unexpected? That’s because your brain predicted incorrectly based on its stored knowledge of fairy tales—it made a prediction error—and then adjusted its prediction in the blink of an eye based on the final words: a few skipping stones of visual information. When you interact with your friends, parents, children, lovers, teammates, therapist, or other close companions, you and they synchronize breathing, heartbeats, and other physical signals, leading to tangible benefits. Holding hands with loved ones, or even keeping their photo on your desk at work, reduces activation in your body-budgeting regions and makes you less bothered by pain. If you’re standing at the bottom of a hill with friends, it will appear less steep and easier to climb than if you are alone. If you grow up in poverty, a situation that leads to chronic body-budget imbalance and an overactive immune system, these body-budgeting problems are reduced if you have a supportive person in your life. In contrast, when you lose a close, loving relationship and feel physically ill about it, part of the reason is that your loved one is no longer helping to regulate your budget. You feel like you’ve lost a part of yourself because, in a sense, you have. When you experience affect without knowing the cause, you are more likely to treat affect as information about the world, rather than your experience of the world. This phenomenon is called affective realism, because we experience supposed facts about the world that are created in part by our feelings. For example, people report more happiness and life satisfaction on sunny days, but only when they are not explicitly asked about the weather. When you apply for a job or college or medical school, make sure you interview on a sunny day, because interviewers tend to rate applicants more negatively when it is rainy. And the next time a good friend snaps at you, remember affective realism. Maybe your friend is irritated with you, but perhaps she didn’t sleep well last night, or maybe it’s just lunchtime. The change in her body budget, which she’s experiencing as affect, might not have anything to do with you. People like to say that seeing is believing, but affective realism demonstrates that believing is seeing. In short, you feel what your brain believes. Affect primarily comes from prediction. You might believe that you are a rational creature, weighing the pros and cons before deciding how to act, but the structure of your cortex makes this an implausible fiction. Your brain is wired to listen to your body budget. Affect is in the driver’s seat and rationality is a passenger. It doesn’t matter whether you’re choosing between two snacks, two job offers, two investments, or two heart surgeons—your everyday decisions are driven by a loudmouthed, mostly deaf scientist who views the world through affect-colored glasses.